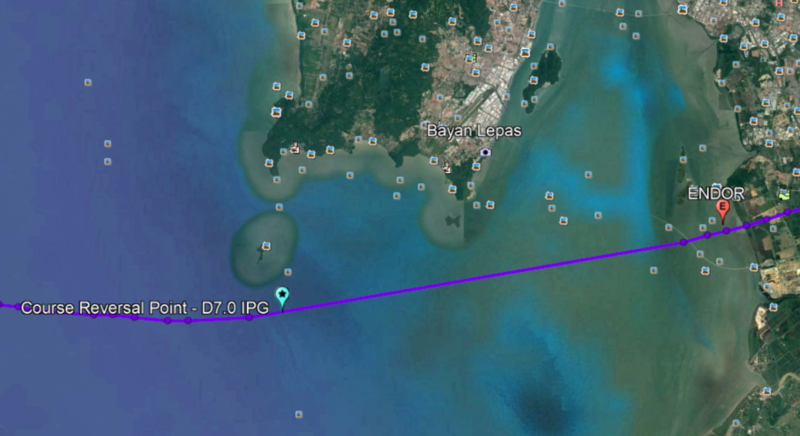 Did MH370 (9M-MRO) attempt to divert to Penang International Airport (WMKP)? 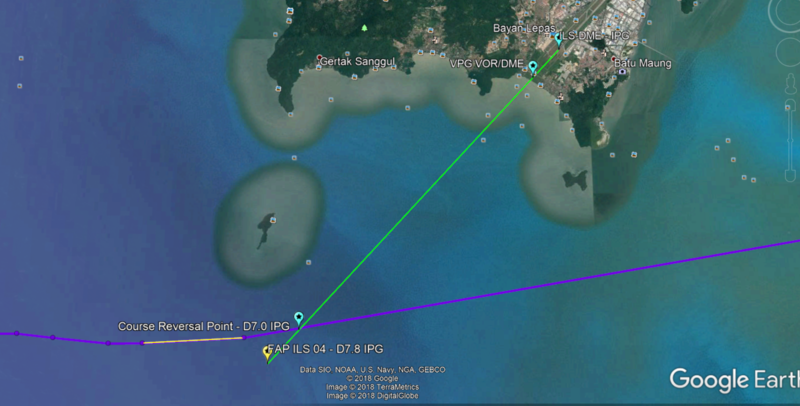 Did MH370 attempt to divert to Penang International Airport soon after it had passed the waypoint IGARI? In this paper I will outline the reasons why I think MH370 attempted to divert to Penang International Airport, but was unsuccessful to make the descent and landing there as it may have intended. The evidence for this is provided by the primary surveillance radar data at Kota Bharu and Butterworth. 1. Below is the primary surveillance radar data trace, provided by Mike Exner. This plot was derived from a reliable source. The data points show what is thought to be MH370's track after the turn back from IGARI. It crossed the northeastern coast about 5 miles north of Kota Bharu airport and continued in a southwesterly track towards a point 7 miles south of Penang International Airport before turning northwesterly until it was out of primary radar range. Primary Surveillance Radar Trace of what could be MH370 as it turned back from IGARI and headed across the northern Malaysian peninsular. 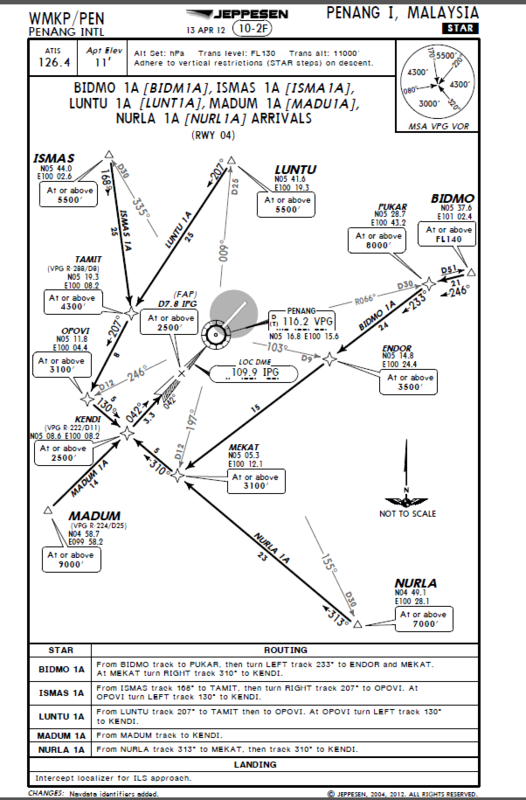 Below is the published STAR or Standard Terminal Arrival chart for aircraft landing on Penang’s runway 04. The arrival procedure that concerns MH370 is the BIDMO 1A arrival which starts at the waypoint BIDMO, and then proceeds to PUKAR and ENDOR. The other point of interest on that arrival chart is the point labelled (FAP) D7.8 IPG. This is the final approach point for aircraft landing on runway 04 using the ILS approach procedure. It is a point in line with the runway at 7.8 miles from IPG which is the touch down point on the runway. 2. Below are the location of the waypoints, BIDMO, PUKAR, ENDOR superimposed on the primary surveillance radar data plot. The latitude/longitude coordinates of these waypoints have been derived from the Jeppesen STAR (Standard Terminal Arrival) chart (see above) current at the time of MH370's disappearance. Jeppesen charts are the industry standard and are used by many airlines operating around the world. Under normal circumstances, aircraft are usually cleared to arrive at an airport via a Standard Terminal Arrival procedure (STAR) which specifies the route required to be flown via specific waypoints. Standard Terminal Arrival procedures may also specify altitude and airspeed constraints during the arrival. In an emergency pilots may choose, or, air traffic control (ATC) may direct aircraft to not fly the full Standard Terminal Arrival procedure but take short cuts to track directly to waypoints along the arrival route to expedite the arrival and landing. This is also commonly done under normal operations when ATC needs to sequence traffic in busy airspace. The primary surveillance radar plot pictured above suggests that MH370, after turning back from IGARI, may have tracked closely to BIDMO and PUKAR waypoints of the BIDMO 1A Standard Terminal Arrival and passed directly overhead ENDOR. 3. 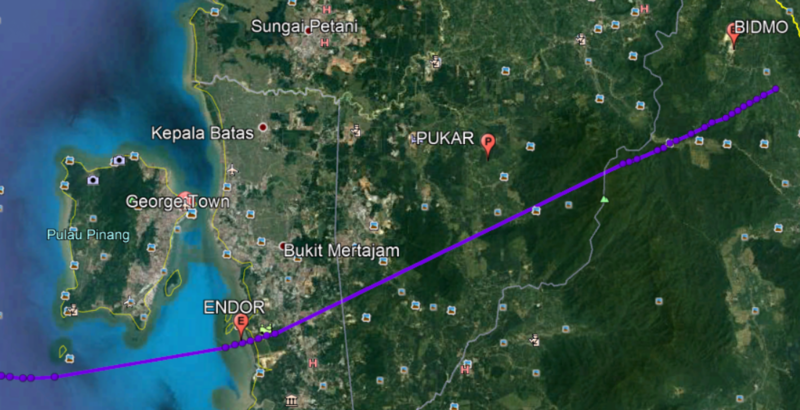 From ENDOR, it appears MH370 then tracked directly to a point from which a course reversal procedure can be flown to allow intercept of the final course for runway 04 at Penang Airport. This point for the course reversal procedure is a published point on the Instrument Landing System (ILS) approach chart for Penang’s runway 04. This point is located 7 miles from the touch down point on the runway. On the ILS approach chart, it is labelled D7.0 IPG. The primary surveillance radar data suggests that MH370 may have flown directly overhead this point to commence the course reversal procedure. From ENDOR MH370 may have proceeded directly to the course reversal procedure point. Penang Airport is located at 'Bayan Lepas' in the picture above. 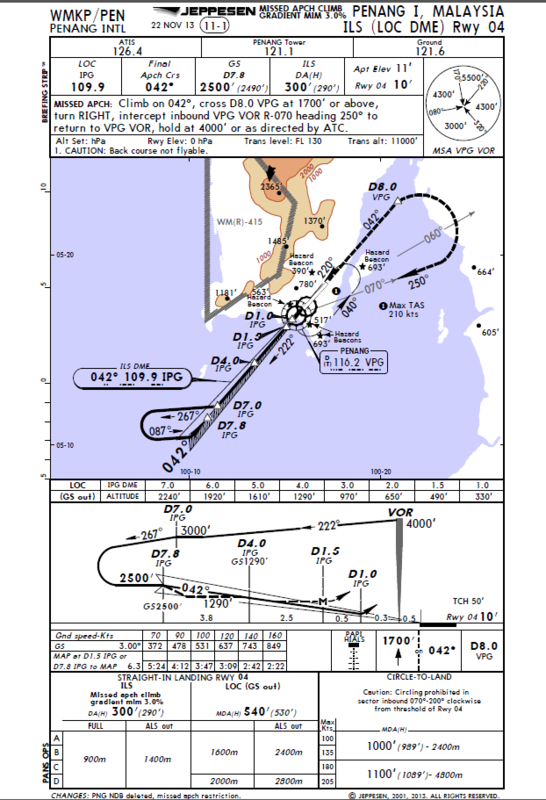 The ILS approach chart for Penang's runway 04 is shown below. 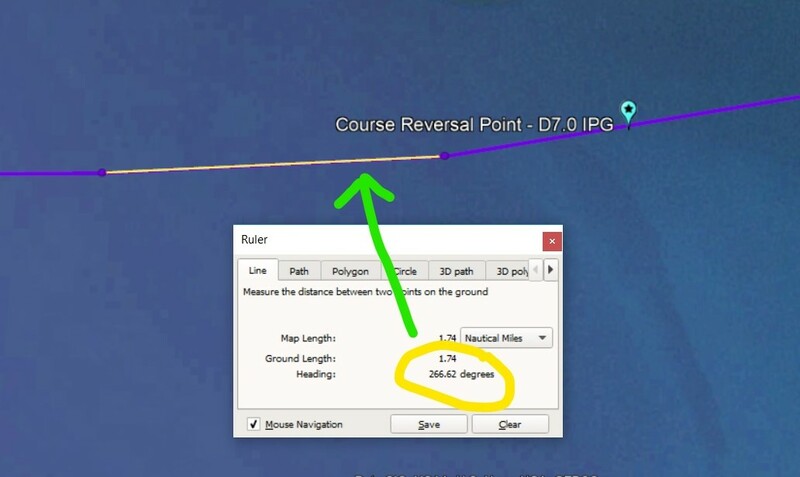 The course reversal point is the point labelled D7.0 IPG on the chart. It appears that MH370 flew DIRECTLY OVER this point. 4. After flying over D7.0 IPG, the procedure calls for a track of 267◦ Magnetic to be flown. The primary surveillance radar trace shows a slight turn to a track of 266.62◦ True. Rounding this up gives us 267◦ True. There was zero magnetic variation in Penang in March 2014 so 267◦ T is the same as 267◦ M. From the primary surveillance radar data plot it appears MH370 flew the commencement of the course reversal procedure EXACTLY as published on the ILS approach chart by tracking outbound on a course of 267◦M . It appears that MH370 may have made a slight right turn to track 267◦ M outbound to commence the course reversal procedure for the ILS runway 04. After flying outbound on a track of 267◦ M, to complete the course reversal, MH370 was then required to make a 180◦ turn to the left to track 087 ◦ M and then intercept the localizer to line itself up with the runway. It would then track inbound on the localizer to cross the final approach point at 2500 ft to commence the final approach in to Penang airport's runway 04. (See the diagram of the ILS approach chart above). Location of the FAP, (Final Approach Point) in relation to the course reversal procedure point and the localizer inbound course (in green) for ILS runway 04 at Penang. The course reversal procedure commences with an outbound track of 267◦ M, followed by a 180 ◦ turn to track 087 ◦ inbound to intercept the localizer course of 042◦ (in green). This latter part of the course reversal procedure which required MH370 to make a 180◦ turn to the left to track 087 ◦M did not happen and MH370 continued flying on until fuel exhaustion. 5. In summary, 3 definitive events suggests strongly that MH370 diverted to Penang International Airport in an attempt to land on runway 04. MH370 tracked DIRECTLY OVER the waypoint ENDOR on the BIDMO 1A standard arrival procedure. 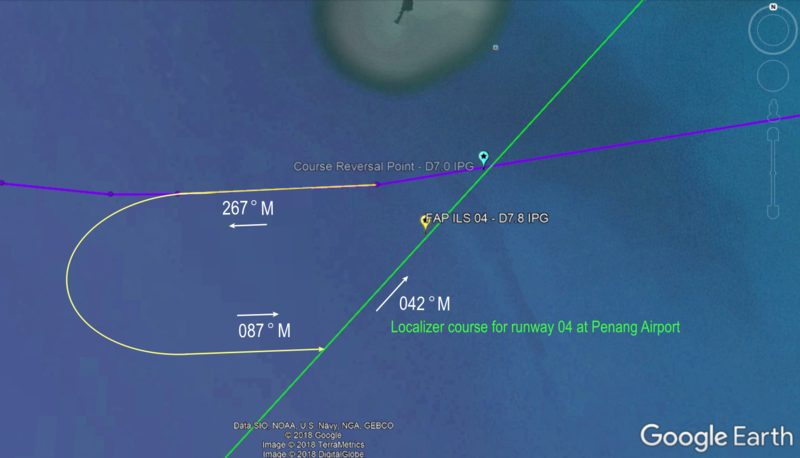 MH370 tracked DIRECTLY OVER a point from which a course reversal procedure could be flown to enable it to line up with Penang airport's runway 04. This point is labelled on the approach chart as D7.0 IPG. MH370 turned right on a track of 267◦ M to commence the course reversal procedure as it was required to do as published on the instrument approach chart. Some may argue that these are lucky coincidences that MH370 made these crossing waypoints and tracks. If MH370 passed by these points by a few miles or so, then it may have been just a coincidence, however the primary surveillance radar data plot suggests that MH370 flew DIRECTLY OVER ENDOR, the D7.0 IPG fix and tracked to the degree, the published track for the course reversal procedure. You cannot get any more precise than this. When you consider that the flight back from IGARI towards Penang appears to be hand flown manually without the autopilot engaged, this then demonstrates an example of fine flying skills and airmanship, most likely by Captain Zaharie. 6. Why then didn’t MH370 complete the procedure turn to intercept the localizer for the ILS and complete the approach and landing? There could be several reasons for this. The lateral tracking, in my opinion, unequivocally shows that MH370 was trying to set itself up for the landing at Penang but may have been at too high of an altitude and too fast an airspeed to conduct the approach. The ground speed of the MH370 at this point is estimated to be approximately 517 knots which also suggests that it was at an altitude above 30,000 ft. I will elaborate more about why this may have been so in subsequent reports. The fact that MH370 appeared to be flying manually without the use of the autopilot at this point would suggest some kind of systems malfunction had occurred as they were not tracking in LNAV, but from what appears to be very ‘back to basics’ navigation using radio navigational aids and a heading and possibly even combined with visual navigation (the city lights of Penang on a clear night can be seen as far as 100 miles out at altitude). If they had dual FMC failure, then they would not have LNAV available for automatic tracking and sequencing of waypoints and no VNAV available for descent planning which could leave them too high on the descent and approach profile. This might explain also why MH370 did not fly the full STAR tracking to BIDMO, then PUKAR and ENDOR, but flew directly to ENDOR instead. 7. Why would a course reversal procedure be attempted? Why not simply intercept the ILS localizer (final approach course) from the track coming from ENDOR? Coming from ENDOR, MH370 was on a track of 260◦ T. Magnetic variation = 0, so its magnetic track is also 260◦ M. To intercept the localizer to line up with runway 04 would require a right turn of 142◦. This is incredibly hard to do for any aircraft, let alone a widebody airliner that would be flying at about 200 knots (370 km/hr). The course reversal procedure has an outbound track of 267◦M, then a 180◦ left hand turn to a track inbound on 087◦ M. This then creates a much easier intercept angle of 45◦ to intercept the localizer for runway 04 which has an inbound course of 042◦ M. Penang has a magnetic variation of 0 degrees (during March 2014) so Magnetic tracks are the same as True. 8. Could the pilots have been incapacitated soon after passing Penang? The primary surveillance radar plot after passing the course reversal point shows many small track changes over short distances (38 track changes over a space of 33 nautical miles). Many track changes over short distances after missing the course reversal may suggest pilot incapacitation from this point. Each of the dots above represent a non linear path with minor changes in direction. There were 38 track changes over a distance of 33 nautical miles. There was frequent manipulation of the control yoke whereby the aircraft was under intermittent manual control by partially incapacitated pilots. The pilots were completely incapacitated and the aircraft may not have been under any positive control by anyone and was left meandering on its own accord at random, possibility resulting in a phugoid flight pattern. The aircraft was flying under manual control by someone with no clear direction or destination in mind. 9. I would like to make one last point. The Captain of MH370 was a Boeing 777 TRI/TRE. This means that Captain Zaharie was an instructor on the Boeing 777 as well as a Malaysian Department of Civil Aviation delegated examiner. In this role as a line Captain instructor and examiner, he would have spent many hours in the simulator training other Captains and First Officers for such a scenario where a return to base, or a diversion to a nearest suitable airport in an emergency had to be made as part of pilots’ recurrent training. Training Captains do these kind of training events frequently and I have no doubt that MAS would have used Penang as a diversion aerodrome for such, considering Penang is one of the major airports in Malaysia where the Boeing 777 can operate from. My point here, is that Captain Zaharie in this role would know this airport and the instrument approach procedures very well. If there was any pilot who could pull this suggested scenario off, involving most probably manual flying under abnormal operations with limited cockpit instrumentation and resources, it would have been him. The accuracy of the flying exhibited as shown from the primary radar data plot showed extraordinary precision flying in trying circumstances. The possibility that MH370 was flown without the autopilot engaged after turning back from IGARI. If this is true, then this is a huge point to consider because a key assumption of the multi-million dollar search for MH370 in the Southern Indian Ocean was that it flew with at least one of the autopilot modes engaged. As mentioned in this report, the many track changes over short distances that we see from the primary surveillance radar data trace does not resemble the behavior of an aircraft that was flown with the autopilot engaged. It suggests that MH370 was under manual control for the whole time it flew back from IGARI and across Malaysia covering 262 nautical miles until its radar trace was lost. The implication of flight with autopilot disengaged is also highly significant. If a pilot, or anyone who was in control of MH370 contemplated on flying the aircraft for the next 7 hours until fuel exhaustion, they most likely would not be flying the airplane manually with the autopilot disengaged. On the other hand, there are reasons for why a pilot would fly with the autopilot disengaged, with the most likely reason being due to a systems malfunction. More about this in a later report. The altitude of flight level that MH370 was flying after the turn back from IGARI. This is another significant consideration as the altitude that the aircraft flew will have implications on the speed, fuel consumption and consequently the time that MH370 can remain flying, that is, it's endurance in the air. Furthermore, not maintaining a consistent altitude during the flight would also suggest some kind of systems malfunction had occurred. It may also suggest that there was limited control input from the pilots possibly due to pilot incapacitation. KMZ files (to be used with Google Earth) for BIDMO, PUKAR, ENDOR, FAP D7.8 IPG, D7.0 IPG (course reversal point), ILS DME IPG, LOC ILS 04 can be downloaded from here. This website explores alternative theories on the disappearance of MH370 and encourages thinking outside the box. Ideas presented here are my own and are based on research conducted by myself,a current airline pilot with 5000 hours flying experience. I have experience flying in Australia, China, Malaysia, Indonesia, Singapore and Thailand airspace in the past and I am currently flying in the USA, Canada and Mexico. All constructive comments, critiques and questions are welcomed. Did MH370 attempt to divert to Penang International Airport?